Ozone 4 is flexible yet easy to use, and it gives great results. All in all, it's the best software mastering package available. Amount controls per module. Automatic gain compensation. Brilliant sound throughout. Very easy to use. Mid/side processing. GUI sometimes cramped. A few minor bugs to be ironed out. Ozone 4 offers six mastering modules. The new preset management system is excellent. Mastering is a process that's as simple or as complex as you want to make it. From minimalist solutions, such as slapping a loudness-maximising limiter on the master bus, to endlessly tweaking sprawling chains of plug-ins, it can be frustratingly difficult to know whether you're under- or over-cooking your master and really doing what's best for your tracks. In such cases, having access to a one-stop software mastering solution can be a welcome relief, especially for the less experienced engineer. Ozone 4 is one such product: a "complete mastering system" in DX/VST/RTAS/AU plug-in format running right inside your DAW. Ozone has seen three previous incarnations, and its GUI remains instantly recognisable, although it's been somewhat updated and is now a touch slicker. More crucially, the audio processing side of things has received a stimulating shot in the arm. Ozone 4 follows the same tried-and-tested format as its predecessors, with six modules representing common mastering processes - these can be dragged into just about any order you like via the Graph button (the only restriction is that the multiband processors have to be located adjacent to each other). 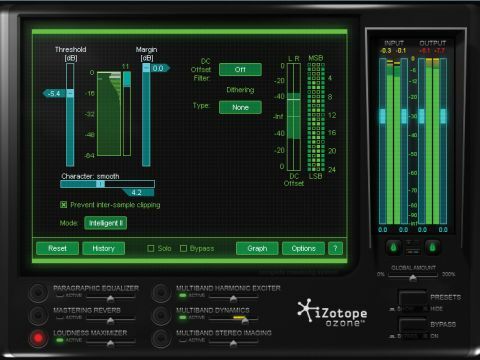 You'll usually place Ozone's Paragraphic EQ module first in your mastering chain. This has eight bands, operable in Analog, Digital (ie, linear phase) or Matching modes. The latter enables you to capture 'spectrum snapshots' of other mixes in order to apply their tonal characteristics to your own. It works well in practice, although the associated snapshot menu obscures the EQ display, which can be annoying (this happens quite a lot with Ozone's pop-up windows). However, you can also select multiple EQ nodes and adjust them as one, which makes up for it. Ozone's so-called Mastering Reverb has always been a contentious inclusion, as it's generally considered that if you're adding reverb during mastering, you should really consider remixing. However, that's not always an option, and Ozone's reverb can work wonders on dry mixes, especially using the mid/side modes. Ozone 4 contains three multiband processors (adjustable from one to four bands), and these now have numerous extra features. Common to all is a handy Learn mode that automatically sets the crossover points to suit the frequency content of the incoming material. The four-band Harmonic Exciter adds saturation per band, complete with drive and mix controls, and there are time offset controls for subtly tightening the bass. Four saturation modes are available: Tape, Tube, Retro and Warm. The latter is new for v4 and is perhaps the cleanest and roundest-sounding. Meanwhile, the Stereo Imager performs band-specific widening/narrowing of the stereo field - nice! While you might think dynamics and limiting processors have been done to death, Ozone 4's stand out with their fantastic sound, clever functions and intuitive operation. Multiband Dynamics is an extremely versatile multiband compressor/limiter/expander/gate with automatic gain compensation and a new Mix control that gives you instant access to parallel compression. The Loudness Maximizer keeps it simple, with just threshold, ceiling and timing sliders. In addition to the pre-existing Soft, Brickwall and Intelligent modes comes the even smarter Intelligent II, and boy, does it do a good job of producing loud yet coherent masters! It's one of the best we've tried, and is easily up there with PSP Xenon and Voxengo Elephant 3. There are also numerous dithering options. Mid/side processing is where stereo audio is converted from a left/right pair into centre (mono sum) and sides (difference between left and right), so that each can be processed independently, then decoded back into stereo. As centre-panned instruments (drums, bass, vocals) tend to have different characteristics to those at the sides (guitars, big synths, reverb), mid/side processing can give greater control during mastering. Four modules (EQ, Reverb, Exciter, Dynamics) can operate in M/S mode. When switching between mid or side settings, the controls turn red or blue, so you always know what's what. Mid/side EQing might be used in the following situation: to brighten up a centrally-panned vocal (mid), while adding more low-mids to hard-panned guitars (side). Obviously, with the reverb you can add ambience to the centre only to bring out a vocal or kick, or to the edges for widening the sound. As for the Dynamics module, with four bands operating in mid/side mode, you essentially have eight separate compressors. In the hands of the more experienced engineer, this can really bring out the best in your material - for example, highlight the thump and snap of drums (mid) without making the guitars (sides) pump excessively. One great addition to Ozone 4 is the set of six omnipresent blend sliders, which offer a quick way to mix in more (or less) of a particular module. For example, if you've got some tasty compression on the go, but it's a bit too slamming, backing off the Multiband Dynamics' modules blend slider adjusts the Mix control of each band, which might be all that's needed to tame it. There's also a Global Amount slider for adjusting the overall, er, Ozone level. The mastering suite now sports a brilliant preset manager, with 100 ready-made settings. Most outstanding are the macro presets, which feature sliders right in the menu, enabling you to audition and roughly tune a mastering chain before committing to it. You can also load individual modules from a preset, and advanced users are encouraged to make their own macros by linking key controls to the sliders - this can save a lot of time if you're regularly mastering. Further new goodies include automatic compensation for level changes introduced by Ozone, enabling a proper comparison between mastered and unmastered audio, without being bamboozled by the 'louder is better' effect - excellent! Ozone 4 also supports Bob Katz's K-system metering and, though it might not be new for v4, we have to mention again the masterstroke that is the Undo History. Ozone sounds and works a treat. It's just better conceived and easier to use than its contemporaries. What more can we say?